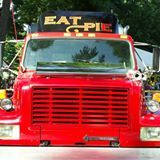 Pies on Wheels presents a great opportunity for you to say "Thank you" to your hard working staff. Consider a pizza party at the workplace...we'll come to you and provide wood-fired cuisine for your staff at lunch. Lunch will include unlimited pizza, mixed baby greens salad, hot "out of the oven" S'mores, bottled water and all paper products needed for a great "Thank you for all your hard work" lunch!